Our 2019 season kicked off with a bit of a BANG , Qualifying was hectic to say the least and I only managed a dismill 7th in class in a jammed packed field . 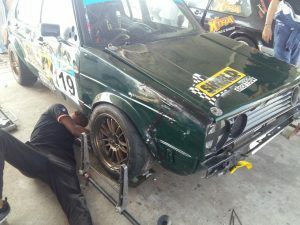 Starting in the middle of the field in pre race paddock was a novice mistake on my behalf as this made it extremley difficlut to get a clean lap in Quali … lesson learnt for the next event is to get to the pre race paddock in a timely fashion and then go like a bat out hell to ensure a clear run. Needless to say, I had a Porsche go into the right side of the car, damaging the control arm and the front right hand side of the car and luckily he was uninjured . I was extremely frustrated with the Marshalls as I could see this accident coming a mile away …. Sometimes common sense must prevail, this incident could have been avoided and luckily no one was seriously injured. Marshalls brought the car back to the pits on flat bed and with the front suspension collapsed I thought my racing for the day was done. Next minute I was swamped by Oom Jannie van Rooyen, Gerhard Henning, Dean Gregory, Dirk Lawrence and Thabiso – our wheel alignment guru. Missing heat 2 was not an option and all jumped into action getting the car ready for Heat 2. This was simply amazing and a big thank you to all. Starting from the back of the grid I managed to gain a further 5th position in what was to be a short race as a nasty incident between veteran George Bezuidenhout and Gerhard Henning happened on lap 2 which brought the race under the safety car for 3 laps, before the race continued. 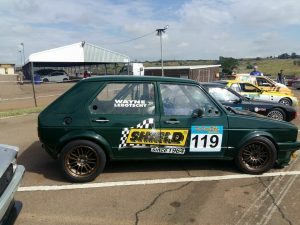 I look forward to our next event at Midvaal raceway and aim to improve on my current standing and hopefully stay out of trouble. Thank you for your continued support Shield Chemicals.